With Fiat showing up in the news everyday, I thought it would be interesting to look at how they’re marketing their key product -- the Fiat 500. The 500 campaign is “We have something to say”, but Fiat wants to hear what you have to say so they have provided a self-expression focused digital implementation. There are several ways for Fiat 500 owners, enthusiasts, and aspirational consumers to express themselves on the 500 Wants You website. Speak 500 on Video: Send Fiat a video of you saying “500” in your native language. 500 Jingle Video Box: Create you own soundtrack to share on the homepage or download as a MP3 for your own use. Plus, something called “Dante” will even dance to it. 500 Questionnaire: Take a survey (you can’t now, the survey is closed) to discover how well you and the Fiat can co-exist. 500 Video Configurator: This is a build module that allows you to see your custom built 500 in a video sequence. You can send this to a friend and save it for later view. Fiat Air Drive: Showcase you driving a Fiat, well not a real Fiat; rather, something you created with cardboard or similar material. The videos are then shown on YouTube and 10 winners were selected. They each received 16 GB iPod Touch music players. Feelings of 500: This allows visitors to share their thoughts on a Diesel jeans version of the 500 in 160 words or less. 500 Faces: Morphs a face with a classic image of a Fiat 500. Why? So you can send an e-card of it. 500 Wants a Mascot: Create a mascot inspired by the 500. Who won? “Dante” the dancing thing from the Jingle Video Box. 500 Wants Your Ad: Two winners were chosen from the 14 finalists selected by our professional jury out of the more than 3300 communication ideas for the launch of the new 500. The Ad and Mascot contests had significant prizes associated with them and ended up in some relatively compelling professional content. The winners from the Ad contest were showcased at Cannes. The mascot winner collected 3,000 euros and the mascot was featured in 500 communications. As you can tell, Fiat has turned “We have something to say” into listening what you have to say; even if, what you have to say adds more useless content to the Internet. I actually spent some time reviewing the Air Drive, Video Box, and Speak 500 content and, with only one exception – this weird guy, all of the content is disposable and should not take up a byte of data on a server. Unfortunately, there is very little vehicle content on the 500 Wants You site. The closest thing you could call vehicle content is a 500C Private Preview that showcases a carrousel of photos with your atypical techno festival soundtrack. The Video Configurator could’ve been useful vehicle content; instead, all it does is label each option but gives you no information about the option and pricing is absent. 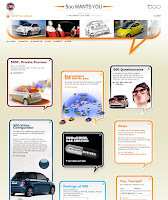 Of course, this is not a shopping website but it would’ve been useful for Fiat to include some integrated vehicle content to help visitors and potential buyers learn more about the Fiat 500 while browsing the content on this site. What I do like about the 500 Wants You execution is that it fits with how the 500 buyer sees himself or herself. The 500 allows a lot of customization in its product options and it’s a cute, quirky car that interests people who want to standout, i.e. express themselves on the highway or city streets. Fiat also extended the self-expression in an experiential way by providing a billboard in Germany that displayed text messages people sent to a number listed on the billboard. Although done before, it was a decent way to extend the self-expression outside of a web browser and webcam. 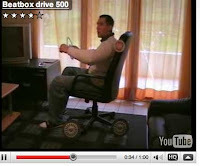 What I don’t like is that most of the content is boring and unbearable to watch, like most user generated content. Listening to someone say "500" in Romanian lacks a certain viral effectiveness and you wonder why you are watching it. Fortunately, Fiat found a couple ways to get some quality content through lucrative prizes that engaged its creative, talented consumers. Or, at least, gave one person 3,000 euros to help buy a new 500.